Independence campaigners want to continue to use the pound in a currency union with England, but U.K. lawmakers say they're not ready to share. And even if they were, the Bank of England would likely insist on tough budget rules that could mean painful austerity for Scotland. Scottish nationalist leader Alex Salmond has refused to outline a 'Plan B', though he's hinted that Scotland may continue to use the pound without U.K. permission. Another option would be to create a new, untested currency. 2. The debt debate: In an early move to reassure markets, the U.K. government said it would honor all its debts -- including Scotland's share -- if there is a split. However, under this scenario, an independent Scotland would owe Britain as much as £130 billion -- or roughly 10% of total U.K. public debt. Supporters of independence say they're ready to pay, and are confident Scotland could manage its debts with greater ease once independence is established. However, credit ratings agency Standard & Poor's cautions that Scotland's economy -- which would be similar in size to Portugal -- would be less resilient to shocks because of its greater dependence on volatile earnings from the oil and gas industry. There are deeper divisions, however, over how much the remaining oil is worth -- a calculation of much greater significance to the future of the Scottish economy. 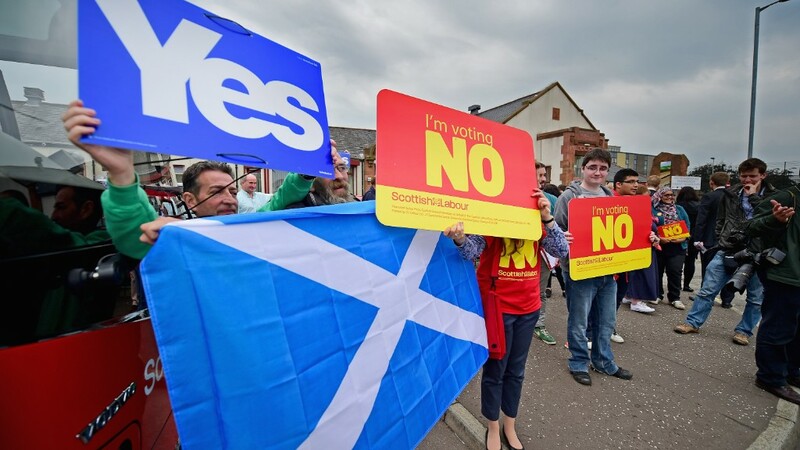 Independence campaigners estimate Scotland's remaining oil is worth about £1.5 trillion. The U.K. government says it's less than one-tenth of that figure. 4. A financial giant: Scotland's massive financial industry seems ready to head for the exits if voters choose independence. The biggest names in banking and insurance, including the Royal Bank of Scotland (RBS), say they would move headquarters and parts of their businesses to England if Scottish voters back a split. The financial sector employs 100,000 people in Scotland and generates roughly £7 billion ($11 billion) for the economy each year, so this raises concerns about future job losses and lower tax revenues for an independent nation. But an independent Scotland would most likely be treated as a new state, and therefore have to apply for membership. That process can take years and all 28 members would have to approve the application -- something some may be reluctant to do for fear of encouraging their own separatist movements. And there's another potential sting in the tail that could be far more damaging for the U.K.
Prime Minister David Cameron has promised a vote on Britain's membership of the EU by the end of 2017, assuming he wins next year's election. 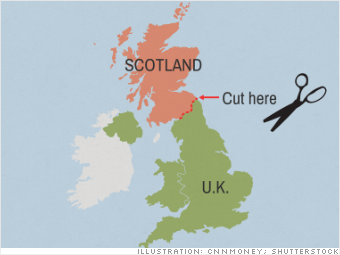 "For the rest of the U.K., losing relatively pro-EU Scotland would raise the risk of a Brexit from the EU," warned Robert Wood, chief UK economist at Berenberg bank.